Click here to watch R14 feature videos on Cineversity. Work faster and more efficiently with numerous enhancements to the workflow and interface in CINEMA 4D R14. You’ll enjoy the more attractive and responsive 3D view with new object highlighting and outlining, and improved OpenGL shadows. Easily access commands and add tags using the new spotlight-style Commander. New composition helpers have been added to arrange your scene based on grids or golden spirals, and you can easily choose the focal distance with the new camera focus picker. 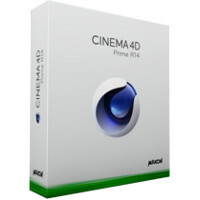 Arabic speakers will especially enjoy the CINEMA 4D interface in their native language, including a specially-designed right-to-left layout mode. The features listed above may not be included in every configuration. Click here for further information.